I thought I’d make something using the corn and peas in my fridge, and started browsing through recipes online. Then, I found a Fried rice recipe with various variations mentioned in it. So, I decided to make my own variation using stuff I had in my kitchen. Add 1 teaspoon ghee to a pan and heat. When the ghee is heated, add the cumin seeds and asafoetida. Add the soaked black chickpeas to the pan, along with water and 1 teaspoon salt, and boil it until the black chickpeas are completely cooked. Dry out the water while stirring by continuing to heat. Put aside. In a wok or large skillet, heat 3 tablespoons oil. 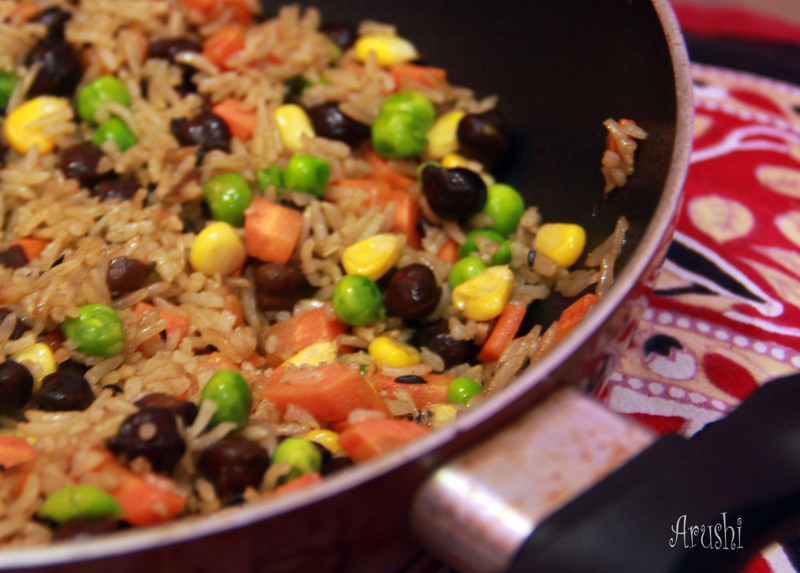 Add rice, some salt (according to taste), peas, corn, carrots, and the cooked black chickpeas. Stir constantly, until the ingredients are mixed up and heated through, for about 10 minutes. If you want, you can season with soy sauce and add green onions before serving. (I skipped this last step). This entry was posted in Bucket List, The Kitchen and tagged vegetarian recipes. Bookmark the permalink. I love rice! You have an interesting food blog. Check mine on http://www.recipesfromeden.com. I post vegetarian and vegan dishes.